Q1: Can you tell us more about the process for identifying and recruiting the twelve elders? The elders are identified by the Le Ciel founders who are guided through extensive research over several years, meditation, their personal experience visiting indigenous people notably in Gabon, and direct guidance from indigenous Elders. In all spiritual research, a day comes when you gain direct access to the source. For some, the source comes through spirituality, for others it comes through the profane. In our case this connection is of a spiritual nature. Through the means of meditation and knowing how to ask the right questions, intuitions, which are verified with practical research, come to us. Through spiritual investigation, intuition brings us to a pragmatic approach. For example, when the trip to Botswana presented itself to us, immediately, one person in our network, whom we hadn’t seen for a long time, came into our thoughts. After a phone call we discovered that not only had he been to Botswana two years prior but that he had kept close contacts there. One contact led us to another and another, until we arrived where we needed to be, sitting with the two Elders. For instance, how was the list of countries chosen- is there an advisory group that recommends suitable individuals/communities? It is not a question of choice. Once again, as a collective, we allow the answers to come to us. When this answer presents itself on two occasions, without any consulting between ourselves, we take this information into account. No group gives us recommendations. As said previously, we go from person to person until we reach the right one. It is work based on faith and synchronicity. How much contact is made with the elders prior to an in-country visit? No contact is made prior to the trip. We make an appointment with our contact in the country and once there we explain why we have come. We have systematically been brought us the elders, through however many contacts are required. Q2: Please can you describe the in-country visits in more detail. How long do these visits typically last, and who leads them? Before leaving for our destination, again through intuition, we know exactly how many days we need to stay. These visits typically last around one week, mostly spent in travels as the elders usually live in very remote places. Once arrived at the airport, we meet our contact on the ground and it’s during this first conversation that everything is put in place for the days to come. Nothing is planned beforehand. We are thus free to follow all the signs that lead us to the elder. The actual meetings with the elders usually take two days, as the team needs to go through layered entourage and spiritual tests before obtaining the opportunity to finally meet the elder. The visits are led by Sophie Monpeyssen and Peter Giblin, who are the key ‘spiritual’ intermediates between Le Ciel Foundation and the elders. The team that travels to meet the elders work together to follow the path laid out in front of them. We know that we have arrived in the right place when those that we meet are waiting for us because they have seen signs in their environment that we are coming. The team is always accompanied by Lucy Martens, another co-founder and award-winning documentary filmmaker. Lucy is filming The Twelve, a documentary about the search for the Council Elders. They are also joined by our photographer, Tinko Czetwertysnki, a lead artist in the Wisdom and Nature exhibition hosted by PHILLIPS auction house. Lucy and Tinko have their own travel budgets. It is common for a third co-founder to join a specific trip when required. Le Ciel hires a guide and translator on each trip with whom we get in touch with before traveling. As we travel with a filmmaker and a photographer, we hire a mini bus with a driver and always choose the cheapest hotels and options to keep the costs to a minimum. Q3: What challenges or risks does Le Ciel face in the management of relationships with indigenous leaders/communities? The main difficulty during the trips is assuring that we remain 100% dedicated to its goal and success. Another possible difficulty, which in reality isn’t one, arises when working in these environments and concerns the notion of protocol. Each society, each culture has its rules of propriety. The idea is thus to arrive in absolute humility, so as to adapt to each situation, while retaining the integrity of why we are there. The idea is not to please but to Be. The idea is not to convince but to open a door to the big picture, as in actual fact all of the elders are already in contact on the spiritual plane. Therefore, we need to open up the same connection and communication on the physical plane, so that contact can be made sitting around a table in one specific place. Assuming the elders have limited previous exposure to Western culture, how is Le Ciel preparing them for a visit to the US? The aim here is not to prepare them but to accompany them. If over however many thousands of years these cultures have preserved themselves, it is not only because of their environmental isolation and the fact that they know how to protect themselves but also because they uphold each one of their values. What, if any, financial or in-kind benefit will communities receive as part of their participation in this project? Each of these communities has received a $10,000 financial contribution with the aim of allowing them to put in place projects regarding their preservation, ecology and also to repair the possible misdeeds of the encroaching industries and societies around them. For example, financing water pumps to source water for the community because their natural streams have been polluted. Each financial contribution has been assessed on a per community and project basis. Q4: Which venues do you have in mind for the meeting of the wisdom council? For the meditation we will be at The United Nations, NYC. The Elders will stay at the DoubleTree Hotel. Q5: Can you please provide more details of the planned symposium? Over three days, the objective of this unique gathering is to address the fundamental tenets of a more ecologically minded and balanced society, and to inaugurate a plan of action that protects and nurtures the Earth’s biosphere and ethnosphere. This meeting is indispensable as indigenous tribes say we have no more than eight years to ensure that humanity rebalances itself with nature. We feel the urgency of the situation and discover every day that we are not alone in this. This event is ambitious in its content and goals – how confident are you of attracting the desired audience? e.g. do you already have industry, business and political leaders lined up to participate? We already have people of influence behind us who not only support the foundation but defend it. We are confident that we will continue to attract exactly the right people to achieve the symposium’s goals. As this a non-political event, we are being led towards individuals who have long awaited the opportunity to express their ideas and collaborate with other visionaries in order to put a concrete plan into action. The participants of each of the 13 workshops will be connected to a private network and given the opportunity to exchange and work together on their designated topic a couple of months prior to the event. Given that such people operate in very different cultural and economic contexts to those of indigenous leaders, how confident are you of curating a constructive dialogue between them? The idea sounds fantastic, but potentially difficult to achieve. A constructive dynamic between all participants will be achieved with the elders; support in inspiring a flow of ideas. 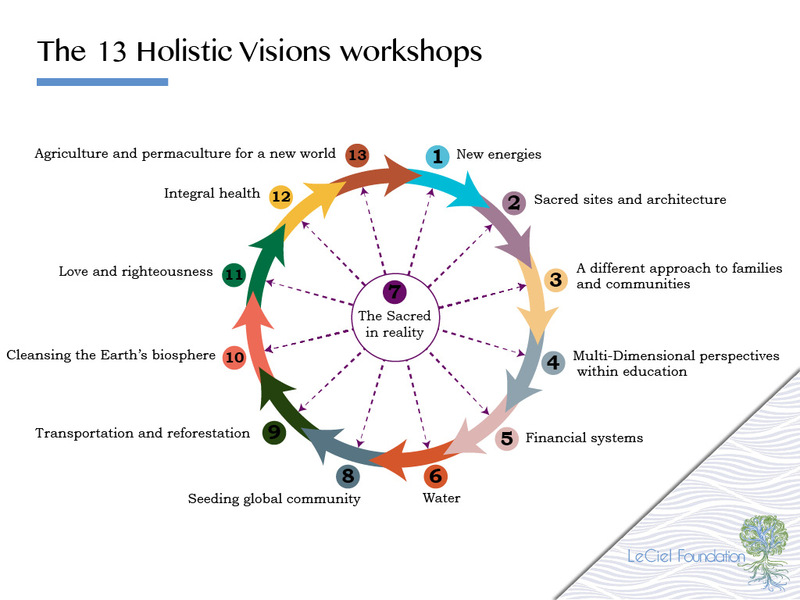 The elder allocated to each workshop is mainly there to serve as a spiritual and energetic lighthouse and a potential source of wisdom to unlock and manifest the solutions that the participants might already have come up with during their pre-symposium work together. We anticipate that a part of their work will be done in silence. Can you define each workshop in greater detail? Defining the workshops in detail is not for us to do, as it would limit the scope of the subject and its outcome. The workshops will be defined by the participants through the exchanges that take place, the opinions that are shared, the accumulated experience in their myriad fields and the natural consensus of the issues at hand. Innovative solutions that are respectful of all life forms and that are founded on integrity are to be reached by the participants, not the hosts. What are the 13 Symposium Workshops topics? Finding and implementing the next best step for energy production, distribution and consumption. Recognizing that sacred sites are fundamental to the planet and therefore need to be respected, protected and integrated into the planet’s infrastructure and architecture. From global to local to individual – the reorganisation of community living. Perceiving the micro, mezzo and macro levels : more interconnected ways of learning. Fair trading in a new world economy. Bringing innovation and fair use back into the hydrological cycle to bring free and clean water to everyone. New alliances, new governance and the decreasing influence of nation states. Creating new paradigms to reduce negative impact of transportation and freight on forests and ecosystems. How to detox and regenerate the land, forests, water cycles, rivers, oceans and air. Breaking free from systemic dependencies, building up a sense of true love, responsibility and integrity in order to navigate life purposefully. Acknowledging the interconnectivity between mind, body and spirit in diagnostics, treatments and methodologies. Returning to biodynamic, high-yield and sustainable methods of farming. Q6: What follow up is planned for your various events? Given the aim of this project is no less than transforming dominant cultural and political paradigms, an ongoing programme of work would seem essential to its success – has Le Ciel given thought to what form this might take, and to the associated funding needs? Contact with the Wisdom Council will be maintained and the elders will be given a role in the process of implementing the solutions. The idea is to keep the individual workshops alive with the original participants and network to create the expansion of action. Le Ciel’s first four projects, the council, the symposium, the exhibition and the film are merely openings onto a bigger picture. The years to come will be rich with new projects to support and to develop what comes from these projects. It will be a crucial time for all to give the best that each can give of themselves to benefit following generations. The documentary The Twelve will be shown at festivals, on TV, online and at schools to continue to create awareness of this important matter. Our goal is to bring together people who have the ideas, initiatives, influence or wealth so that practical, pragmatic and achievable solutions arise from this meeting in the months to follow. The aim of the project is not to transform dominant cultural and political paradigms, but to come up with pragmatic proposals, solutions and projects that will be funded and implemented immediately after the symposium. The aim is to show that answers exist that can be highly effective, scalable and implementable right away. Once we have proof of this through actual examples and references, we will share them in an open source way, and enable global change to emerge as a natural consequence. We are not aiming for global change, we are aiming for global action. Q7: Please can you describe for us the process that led to the formation of Le Ciel Foundation, and the key people involved in the foundation’s formation and ongoing management? The Foundation was established in 2016 as a not-for-profit company limited by guarantee. Le Ciel Foundation has officially been registered as a charity in the UK since January 2019. Please see our Bios and Articles of Governance to learn more about Le Ciel and its team. It is important to realise that each one of us holds in them a small part of a common project and like in ancient times, alone we cannot do anything. Every person who works in the foundation is key. There is no hierarchy here. We work together for the good of one thing- the success of one joint mission that spreads out across numerous projects, over many years. Of course, biographical information can be provided but the important thing is not what each one has already done but what each one can provide. Working with a group synergy based on kindness each one can quickly develop their potential and discover for themselves unsuspected capacities. From union and unity, evolution and the opening of possibilities is brought to life. Q8: What key skills and experience are possessed by Le Ciel’s team? All three projects described requires specific skill sets – film making and events organising, also experience in working with indigenous cultures for instance accompanying leaders on overseas tours, and crucially in convening constructive dialogue between indigenous peoples and Westernised society. What experience do Le Ciel Foundation staff have of these types of work? Le Ciel’s team have direct experience in event organizing, fundraising, film making, spiritual and life coaching, marketing, advertising, PR, permaculture, management, consultancy, ecology, health and healing. The skills missing among the founders are provided by key people in the foundation’s ecosystem who have years of experience and are highly respected in different industries. All the members of Le Ciel are initiated into ancestral traditions, at the very heart of communities that uphold and protect rituals and defend the sacred. The fact that these extraordinary elders have agreed to participate, even though many would prefer to remain at home speaks well of the organisation. Concerning the other projects, it regards administrative, curatorial, organizational, networking skills and each member of this foundation has a specific quality or the appropriate network for these projects to come to life. Q9: What, if any partnerships is Le Ciel forming with other groups working to communicate the power of indigenous wisdom? For the moment, Le Ciel is in contact with many creators and entrepreneurs who share the same values. We have not yet formalised partnerships with other groups as the main focus now is to carry out our first missions for November 2017. Le Ciel will focus on communicating with other groups after the council. We do however have alliances with The Center for Sacred Studies and The Fountain founder, Jyoti Prevatt. Her teams are responsible for the Council of 13 Grandmothers and other organizations and events such as the Unity Concert in Black Hills, which all defend indigenous and tribes’ rights. They have offered us complete support, first by facilitating access to three elders and second, by offering to provide us with translators and assistants for certain elders. As well as forming partnerships with like-minded organisations, we consider it is important to recognize the work that others are already doing. The aim is truly to create an ecosystem in which ever person can create their own project beneath the well-meaning eye of all and with, if necessary, the help of each other. Q10: How much did the fundraising art exhibition raise, and what did Philips contribute to the exhibition costs ? PHILLIPS donated their exhibition spaces in London, Paris and New York and provided many organisational and design services without which this exhibition could not have gone ahead. Le Ciel sourced sponsorship for shipping, printing of catalogues and invitations, and catering costs for the opening previews. We tried to cover as many of the costs as possible through corporate sponsorships so that all proceeds could go directly towards furthering the foundation’s mission. We raised $300,000 through the auction sale.